Between architecture, art and robotics, the borders are thin. 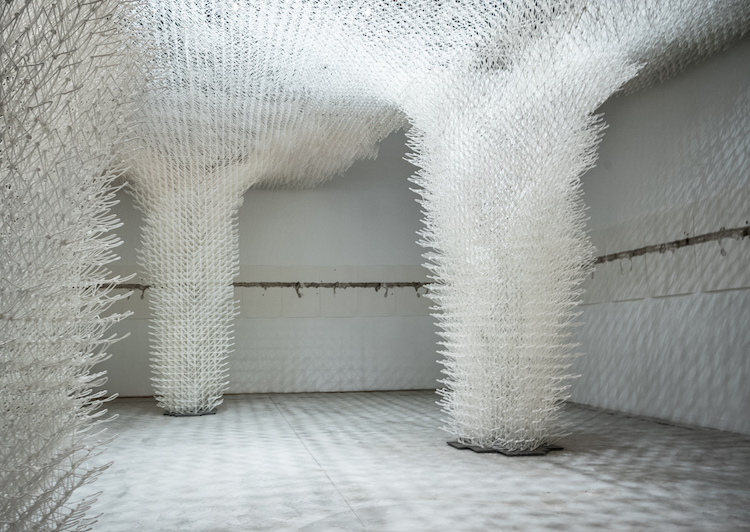 Among the pieces presented at the 16th Venice Architecture Biennale, the Croatian pavilion played the additive manufacturing card with Cloud Pergola / The Architecture of Hospitality. On exhibit since May 26 and inspired by the formation of clouds, the 57-square-meter pergola, at 3.3 meters tall, is one of the most imposing structures to date 3D-printed by robots. When it comes to 3D-printed works of civil engineering, one may recall the first steel bridge in Amsterdam designed by the company MX3D, winner of the Starts Prize 2018, or the French project Yhnova, a house made of expansive foam and concrete. But Cloud Pergola uses neither steel nor concrete—its 300kg of biodegradable plastic make up an airy structure that filters light. Croatian architect Alisa Andrasek created the design, which was realized by AI Build, a company specialized in artificial intelligence and robotics for large-scale additive manufacturing. The pergola, an architectural icon of the Mediterranean, is accompanied by ambient sound to enhance visitors’ immersive experience. Foam, a European “transdisciplinary laboratory at the interstices of art, science, nature and everyday life”, contributed to the friendly Mediterranean atmosphere its Ephemeral Garden soundscape, based on field recordings (markets, forests).